I have taught many students throughout the years who have what could be considered untraditional families. For some students, their grandparents play the major role in their upbringing. 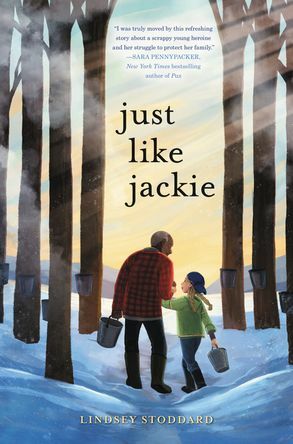 There are definitely middle grade readers who will be able to relate to Robinson, the main character in Just Like Jackie, who is being raised by her grandfather. Robinson has a tough exterior and does not let anyone get away with teasing her about her family even if it means she has to use her fists. When she gets in trouble for fighting at school and her grandfather is called in, Robinson starts to worry that others will find out that something is wrong with him. Lately, he is starting to forget things and get confused. School, also, presents a problem for Robinson when she has to complete a family tree project. Unlike others in her class, she doesn't have any family members besides her grandfather to put on her tree. Robinson would like to know more about her mother and is afraid with her grandfather losing his memory that she will never find out. Robinson is a character I immediately liked. She acts tough, but she has a sweet side to her, as well. Although it gets her in trouble, she stands up for herself and what she thinks is right. The relationship Robinson and her grandfather have with each other is heartwarming. She is determined to take care of him and find a way for them to stay together. Just Like Jackie is a story that shows how family can be more than just those who we are related to. It's also a story of friendship. Robinson's story shows how challenging it can be when one feels different from her peers. Although she doesn't always make the right choices, she learns that friends and family stick together and help one another. This is a book that middle grade readers, whether their families are untraditional or not, can learn some important life lessons. This is one to keep an eye out for when it publishes in January of 2018. Thank you to the author, Lindsey Stoddard, and the book's publisher, HarperCollins, for sharing an advanced reader's copy of the book with my book group, #BookExcursion.